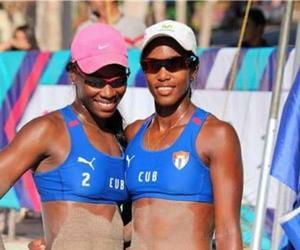 The Cuban pairs of Karell Peña-Daisel Quesada and Leila Martínez-Lidianis Echeverría won the La Paz beach volleyball tournament in the Mexican state of Baja California. Peña-Quesada, the unbeaten leader of Group C, with three wins, defeated Sunday in the final 2-1 Lombardo Ontiveros and Juan Virgen, Mexico B, with scores of 21-13, 17-21 and 15-8 . Meanwhile Martínez-Echeverría, undefeated in Group A, also with three wins, beat 2-1 (21-19, 19-21 and 15-13) Heather Bansley and Brandie Wilkerson, from Canada. According to the NORCECA website, Peña and Quesada won 2-0 in the semi-finals over Jon Mesko and Skymar del Sol (21-13 and 21-11), if the United States A team, while Martinez and Echeverria beat Betsi 2-0 Flint and Kelly Larsen (21-17 and 21-17), also from United States A. The bronze medal for the men went to Jose Rubio and Josue Gaxiola of Mexico A, defeating Mesko and Del Sol 2-1 (21-18, 17-21 and 15-8). The winning duos (m and f) garnered 200 points for the NORCECA ranking, while the second, third and fourth places received 160, 120 and 100, respectively.